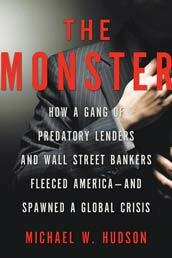 The Monster: How a Gang of Predatory Lenders and Wall Street Bankers Fleeced America—and Spawned a Global Crisis tells the story of the rise and fall of subprime lending by chronicling the rise and fall of two corporate empires: Ameriquest and Lehman Brothers. It is a true-crime exposé of the subprime salesmen and Wall Street alchemists who produced the biggest financial scandal in American history. As the biggest subprime lender and Wall Street's biggest patron of subprime, Ameriquest and Lehman did more than any other institutions to create the feeding frenzy that emboldened mortgage pros to flood the nation with high-risk, high-profit home loans. Among The Monster's cast of the characters are a shadowy billionaire who created the subprime industry out of the ashes of the 1980s S&L scandal; Wall Street executives with an insatiable desire for product; struggling home owners ensnared in the most ingenious of traps; lawyers and investigators who tried to expose the fraud; politicians and bureaucrats who turned a blind eye; and the drug-snorting, high-living salesman who tell all about the money they made, the lies they told, the deals they closed. Michael W. Hudson is a staff writer at the Center for Public Integrity, a non-profit journalism organization. He previously worked as a reporter for the Wall Street Journal and as an investigator for the Center for Responsible Lending. The winner of a George Polk Award, Hudson has also written for Forbes, The Big Money, the New York Times, the Los Angeles Times and Mother Jones. He edited the award-winning book Merchants of Misery and appeared in the documentary film Maxed Out. He lives in Brooklyn, New York.